The Multistrada and I have a special connection. It's the motorcycle that took me to Imola and Coriano in 2013 to pay tribute to Ayrton Senna and Marco Simoncelli. I don't think there is any other motorcycle that could ferry me in comfort, yet maintain superbike rivaling pace on the Autostrada the way the Ducati did. That trip changed the way I looked at sport tourers. It opened my eyes to a world of motorcycling that combined the performance and heart of a superbike and the practicality and comfort of a long distance tourer. It was the cutting-edge technology that allowed the Multistrada to be many motorcycles rolled into one. It also made it one of the most practical machines to roll out from Borgo Panigale. A few months ago, the new Multistradas were launched, but we never really got a chance to test them out until now. For 2016, the motorcycle has gone through a major update. 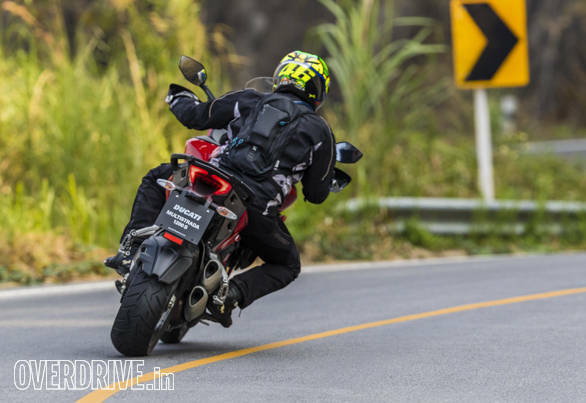 It's also the first of the Thai built Multistradas, so we headed to Chiang Rai in Thailand to really get under its skin. 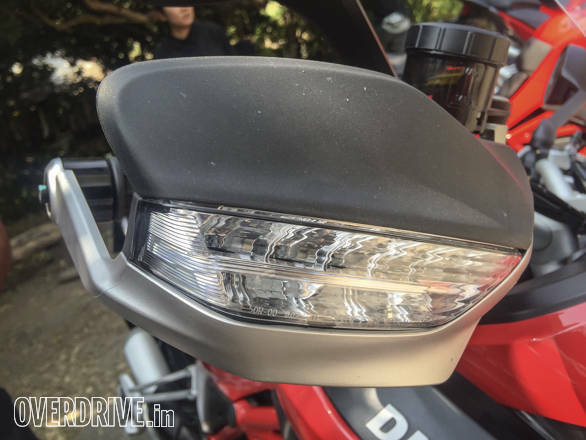 At first look, the Multistrada may look like just a styling update but there's a lot more hiding under the skin. In fact, the only common element between this and the earlier model is the trellis frame. The most important changes are to the updated Testastretta L-twin. Unlike the earlier unit, this one incorporates Desmodromic Valve Timing (DVT). The DVT is, in other words, variable valve timing for both the intake and exhaust camshafts, something so far only heard of in cars. Ducati say that it's the first time that anyone has offered this system in a motorcycle. What they mean is variable timing for both sides is a first. Variable valve timing as a technology has been seen in many older motorcycles for a very long time  the Honda CB400 VTEC, for example. But what does the DVT actually do? It enables valve overlap between -37 degrees and 53 degrees. 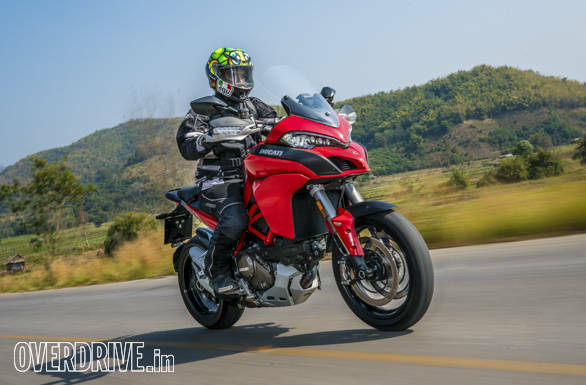 The earlier Multistrada in comparison used the Testastretta-11 degree engine that had a fixed valve overlap of 11 degrees. This meant top-end performance took a hit. The new system continuously varies valve timing, so there is never any lack of power in low or high rpm. Another advantage is that it has helped Ducati extract some more power from the Multistrada's motor. The 1,198cc motor now produces 160PS at 9,500rpm and 136Nm of peak torque available at 7,500rpm. Efficiency is also claimed to have been increased while reducing NVH levels. Of course, this also has a lot to do with the second spark plug that came with the last update on the old Multistrada. The twin-plug setup allows for more efficient combustion and better adaptability to the changing ignition timings. While the Trellis frame is similar to the older motorcycle, the rear subframe is new and made of cast aluminium. The single-sided swingarm too is different and so is the suspension. The front and rear get fully adjustable Sachs units with electronic compression and rebound damping adjustment. Spring pre-load can also be adjusted electronically using the Ducati Skyhook Suspension (DSS), which adjusts damping according to the suspension movement, which is affected by your riding style and the terrain you're going over. The brakes are new and feature superbike like 330mm semi-floating discs and M50 racing callipers, both from Brembo. Like the previous Multistrada, Pirelli has developed special tyres for the sport tourer. The Scorpion Trail II is a dual-compound tyre meant for sport touring and mild enduro use. 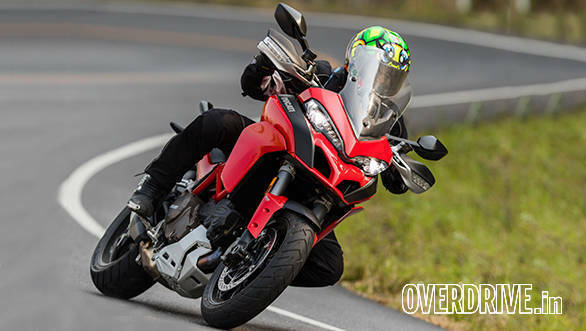 The Multistrada has always been tech-laden and continues to be so in the new-generation model. It's got a long list of standard electronics and even shares some tech, like the Bosch developed Inertia Management Unit (IMU), with the 1299 Panigale. This system uses a gyroscope and an accelerometer to measure pitch, roll and yaw. Features like Ducati Wheelie Control (DWC), ABS, traction control and cornering light (a dedicated LED to light up the inside of a turn while leaning) use this data to keep your backside in the saddle. 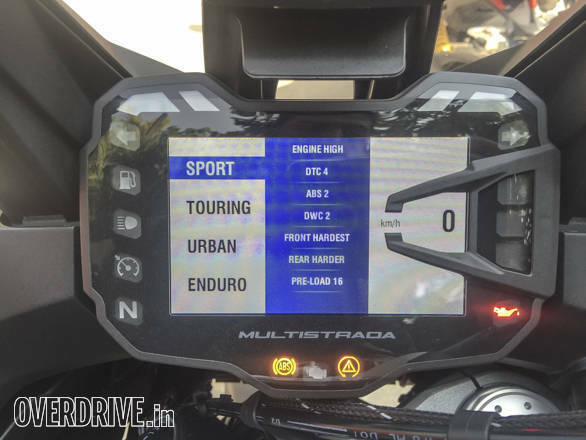 Furthermore, the DSS, DWC and engine power modes can all be customised with various levels of intensity or by just choosing from four riding modes  Sport, Touring, Enduro and Urban. There's also a standard cruise control feature. 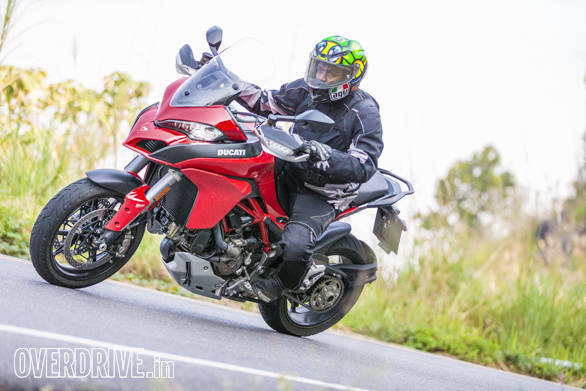 In terms of style, the Multistrada gets a new design that's a lot sleeks and more muscular. The fairing is wider now and the face, a lot meaner, thanks to the pronounced beak and aggressive nostrils. The wider and sleeker headlamps even feature all-LED lighting (an Audi influence) as standard in this S variant and adds to the character. The side fairing flows smoothly from the tank and merges well into the all-new rear. Twin-upswept exhausts is a Multistrada signature feature that has been retained but is now designed to look a lot more aggressive. 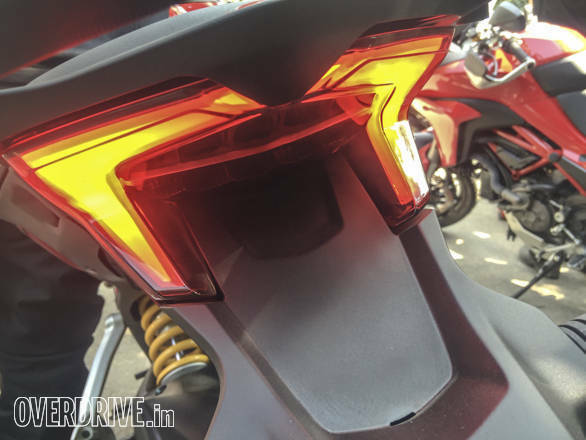 The tail lamp is larger and sharper while the LED lighting looks more Panigale like. The S variant also gets a full colour, TFT instrument console that offers a variety of information depending on the active riding mode. The switchgear has also been redesigned and is now backlit. But, what is it like to ride? 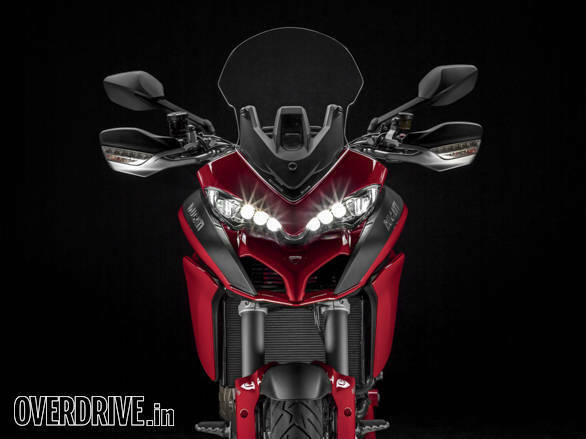 The new Multistrada is an improvement over the previous generation model in every way. I've ridden both models and find the new one to be more usable and rewarding at the same time. The riding position is neutral like before but ergonomics have improved. The seat height can now be adjusted by 20mm and is ideal for shorter riders. The width of the seat has reduced slightly too, this along with the reshaped tank helps the rider grip better with the knees. Start the motor and the Testastretta engine sounds a lot like its predecessor, however the NVH levels are a lot more controlled and refinement has improved. Get going and that's when the real difference is noticeable. It is easily the smoothest Ducati I've ridden. That crude low-down jerkiness is now gone. In fact Ducati claims a 78 per cent reduction in engine shuddering. It is now a delight to ride at slower engine speeds, which makes it a good urban bike too. Ride-by-wire smoothens the power delivery and makes it more linear too. Whack the throttle open and the rush from the engine is very superbike like. It's a quick and fast motorcycle with a lot of power being made throughout the rev range. The oversquare motor is quick to rev and hits 10,000rpm in the blink of an eye. 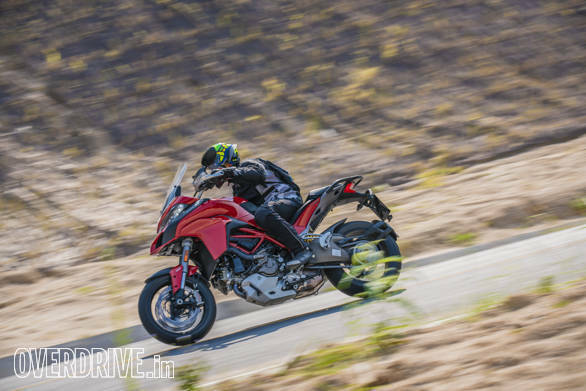 In Sport mode, the Multistrada leaps ahead and if it weren't for wheelie control and the other electronic bits, the sport tourer would have been pointing skyward most of the time. In Touring mode, all of the Testastretta motor's 160PS is made available, but power delivery is smoother. The suspension too is at a more comfortable setting. The engine doesn't knock even when riding in sixth gear at super low speeds, a trait that of the older bike that we are glad has disappeared. Twist the throttle and speeds climb up effortlessly and in no time the engine is back in its power band. In Urban mode, power is restricted to 100PS. It is perfect to ride around town and the intermediate setting of the suspension is well suited to running about town. The Enduro mode also reduces output to 100PS but we couldn't try out this setting, as there were no rough or off-road patches in our riding route. Theoretically, this mode softens the suspension and disables rear wheel-ABS and cornering ABS for suitability in off-road situations. 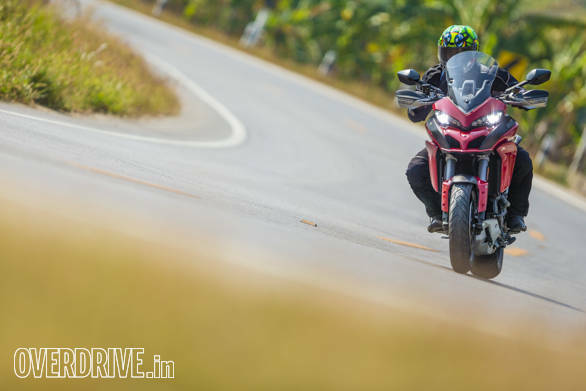 Riding around Chiang Rai in Thailand was very involving thanks to the various twisties and corners on the ride route. The Multistrada isn't a light motorcycle, the new-generation model is even heavier than the outgoing model. However, it is still fun around corners despite being a tall motorcycle. It holds its line well and the seating position made it quite involving to ride. I found the hardest setting of suspension to work really well. In the softer settings, there was always a little weave in the corners. Not significant enough to be a cause for worry, though. Straight-line stability is impressive too. The bike glided over a few broken roads and speed breakers with ease and not once did it feel unsettled. The wide handlebar also adds to the feeling and makes it easier to tame the machine. Braking is equally impressive, the Brembo offers good bite and performance. No surprise there since the 330mm units are similar to the WSBK spec brakes. The Multistrada was always a fast and addictive sport tourer and this new model raises the bar even further. It looks great and has an aggressive stance, gets a long list of electronics and features and most importantly uses the most improved Testastretta motor ever. The engine makes it great to ride in town as well as on open roads. This goes well with the Multistrada's all-rounder image. It's only a matter of time till the Italian motorcycle manufacturer offers the engine in other Ducatis too. The icing on the cake, though, is the price. 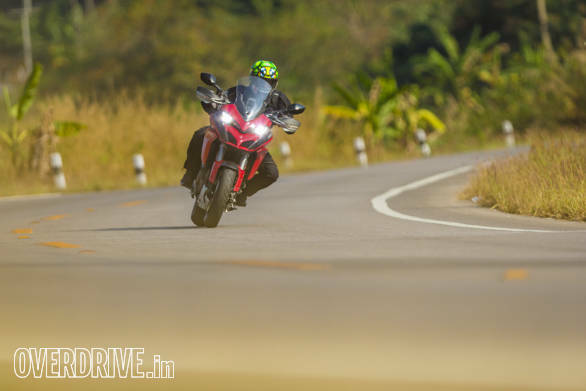 Since the Multistrada is now put together in Thailand and imported to India, the 1200S is priced at Rs 17.6 lakh, ex-Mumbai. At this price, it is more affordable than its European rivals  the Aprilia Caponard 1200 and Triumph Tiger Explorer. Should you by one then? If you don't plan to venture too far off the beaten path, then yes! Then again, if you do plan on doing those round-the-world kind of rides, then there is another Multistrada coming. One with the name Enduro attached to it.